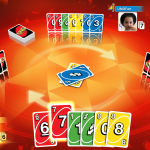 UNO has been an immense popular card game for many generations. Today Ubisoft and Mattel released the video game adaption of the famous family card game on PlayStation 4 and Xbox One consoles. A PC version of UNO will be available later this trimester. The newly released adaption is also part of the Microsoft Summer Spotlight program, as one of the 25 best new digital games of the summer and it will stay in these spotlights until the 5th of September. 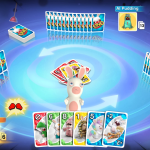 Players can change the classic gameplay with theme packets such as the Rabbids theme that is part of the game upon release. All themes offer new action cards, music and themed backgrounds, allowing the players to personalize their profile to their own desire. Ubisoft will be releasing theme packs such as Just Dance and Rayman at a later stage. Those who don’t know the most iconic classic game should not be alarmed as it is a simple game with requires some tactics in the long run. 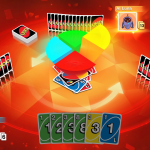 Players add cards to the deck but the card must match by either color or value. Action cards can be used to change the gameplay for a short while. This is the traditional gameplay but the video game adaption also offers a plethora of online and social options such as interactive trainings and tips.